HQ PHOTO EMULSION 250ml - Ready to use. Product of the highest quality, is suitable for the preparation of screen printing matrices resistant to water-based inks, solvent-based or plastisol. This emulsion is particularly suitable when it requires good definition and resolution and a good resistance to long runs. Is easily recoverable after printing. This product is sufficient to achieve about 8-10 frames in the A3 format. Use the emulsion in environments in subdued light bulb or yellow / red. The emulsion should be used within three months if stored at room temperature, or within six months if kept in the refrigerator. The emulsion must never be stored below the freezing point. WASH DEGREASER 100ml concentrate - Degreaser canvas. The wash Degreaser is a degreaser concentrate ideal for the first cleaning of the new canvas on frames. And 'the ideal product to better prepare the frame before being emulsified. The product ensures perfect adhesion between emulsion and canvas frame. After diluting the Degreaser wash in 2.5 liters of water, use a portion of the product to thoroughly clean the 2 sides of the canvas. When finished be sure to thoroughly rinse the cloth with water leaving no soap residue. AutoStrip 100ml concentrate - Removes emulsion. The AutoStrip concentrate must be diluted in 2 to 2.5 liters of water to obtain a product ready to use. 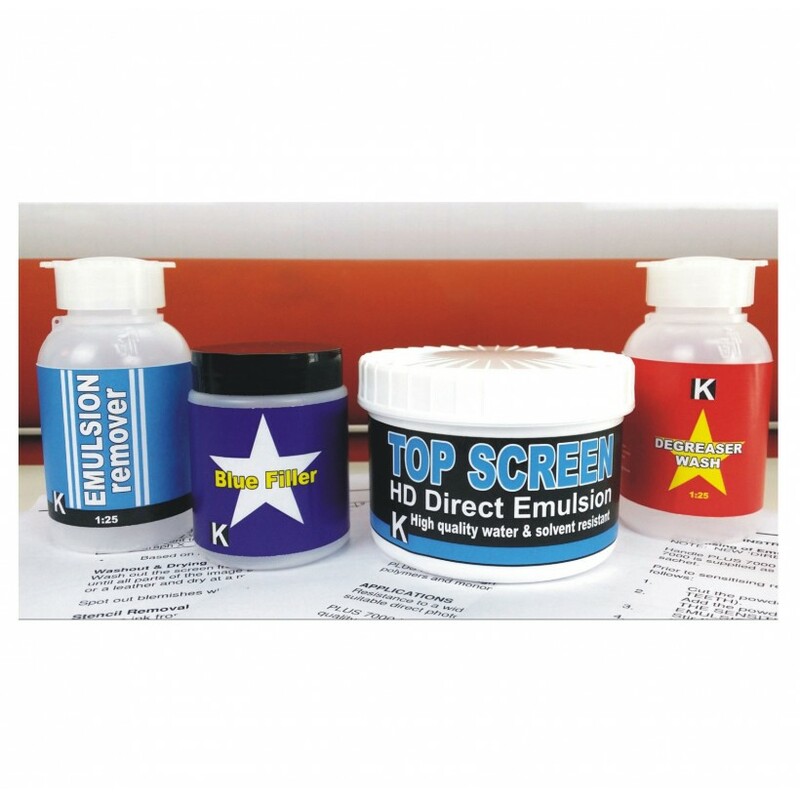 Great for the complete removal of all types of gelatin / emulsion silkscreen. Use a fraction of the diluted product directly onto the frame / jelly and make strofinazioni read with a sponge on the 2 sides of the frame up to completely dissolve the emulsion. Rinse thoroughly with a water jet. BLUE FILLER 50g - corrector engraving. The ready to use product. Great stucco resistant to solvents for the correction of small holes or imperfections that may occur after the incision of the frame. Use a small amount with a brush directly on the hole cover and allow to dry for a few minutes. All our products are in accordance with: RoHS, REACH, SVHC, EN71, IPA-PAHs, PAE. Do you have any questions about Screen Printing Kit mini?